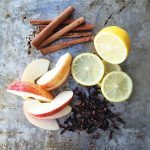 With this Fall Stovetop Potpourri you are 5 minutes away from your home smelling like the coziness of fall baking! Put all of the ingredients into a medium sized saucepan and top up with water. Simmer on the lowest setting and enjoy!